Special events are a big part of the summer for most PROs — not to mention a main source of revenue. Here we’ve rounded up photos for a look back at past events we’ve featured in the PRO magazine On Location series. Hopefully these stories will inspire you to provide your very best service as you take on another busy season. If you have a unique and challenging event on the books this summer, tell editor Jim Kneiszel (editor@promonthly.com) all the details for a chance to be featured in a future issue. Take some photos at your next big event too. You can send them to us here at the magazine to be featured, and it’s also a good idea to promote your successful events on your website and social media accounts. 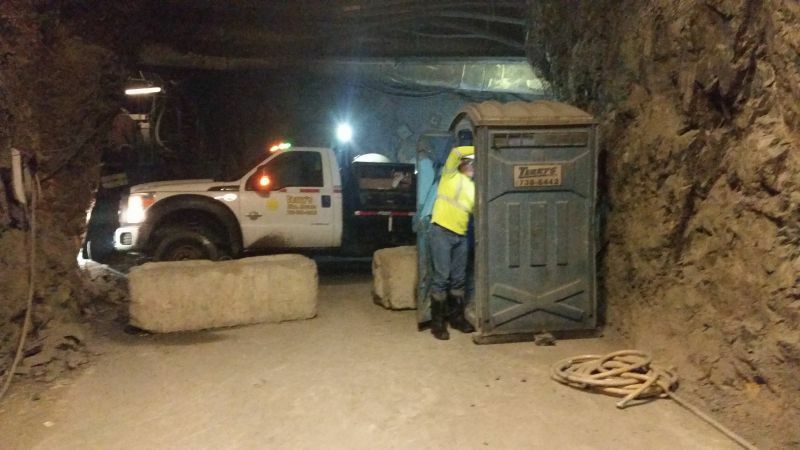 It takes a specially trained crew to deliver and service restrooms 2,000 feet underground at a Nevada gold mine, where temperatures hover at 120 degrees F or more. Located in Elko, Nevada, about 70 percent of Terry’s Pumpin’ and Potties’ customers are involved in gold, silver, gypsum and barite mining. Summer Set Music & Camping Festival took place the weekend of Aug. 11‑13, 2017 at the 160‑acre Somerset Amphitheater in Somerset, Wisconsin. Main activities for the millennial crowd were electronic dance music on multiple stages; camping; tubing down the Apple River; and, of course, eating and drinking. The event usually attracts about 20,000 people, but it was about half that in 2017 due to logistical issues affecting the promoter. 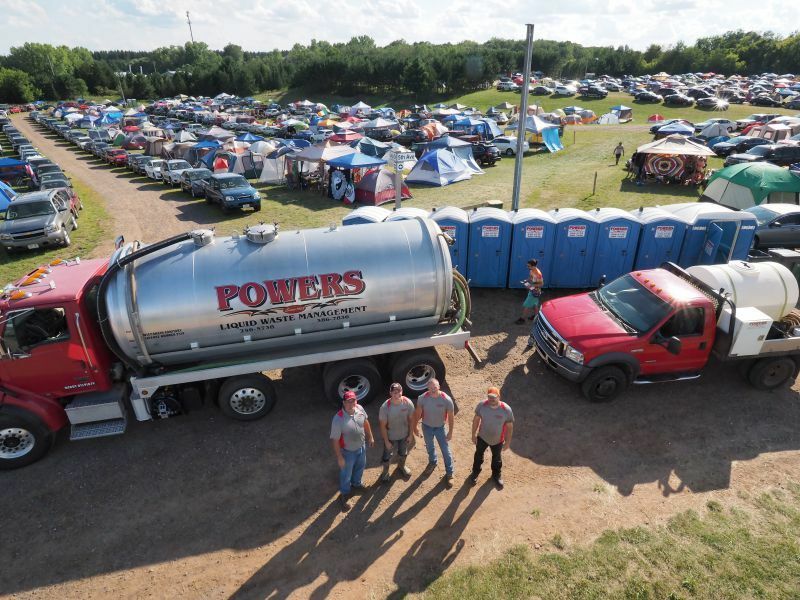 Powers Liquid Waste Management was tasked with providing and servicing portable restrooms, a restroom trailer, hand-wash stations, and holding tanks. They also serviced facility-owned units, restroom, and shower trailers brought in by another vendor and on-site permanent restrooms and showers. In addition, they pumped out RVs. For 29 years, just as fall colors are at their peak, equestrians from Wisconsin, neighboring states, and Canadian provinces have gathered in Caroline, Wisconsin, to participate in Colorama, the state’s largest trail ride and camping event, sponsored by the Caroline Lions Club. In 2017, the town of 270 welcomed over 4,000 visitors — and their horses — the weekend of Sept. 29 through Oct. 1. Eleven fields surrounding the town were organized into campgrounds with a total of 960 campsites. The fundraising event included trail rides, live music, horseshoe and beanbag tournaments, wagon rides, a parade and an auction. Schoenike Septic & Toilet Rentals brought in 119 standard units (24 from Five Peaks, and the rest from PolyJohn Enterprises), one wheelchair-accessible unit (PolyJohn Enterprises), and two hand-wash stations (PolyJohn Enterprises and T.S.F.). Twenty-four were placed behind the large music tent, seven in front of the tent including the wheelchair-accessible unit and hand-wash stations, 12 on the Saturday trail at the halfway point/lunch stop, seven along the trail every couple miles, and the remaining 70 scattered in singles throughout the campgrounds. Because the campgrounds are hilly, most units had to be leveled. Despite the numerous locations, Schoenike says they don’t have any trouble knowing where everything is because the layout is basically the same every year. Preparation of equipment began nearly a month before the event. 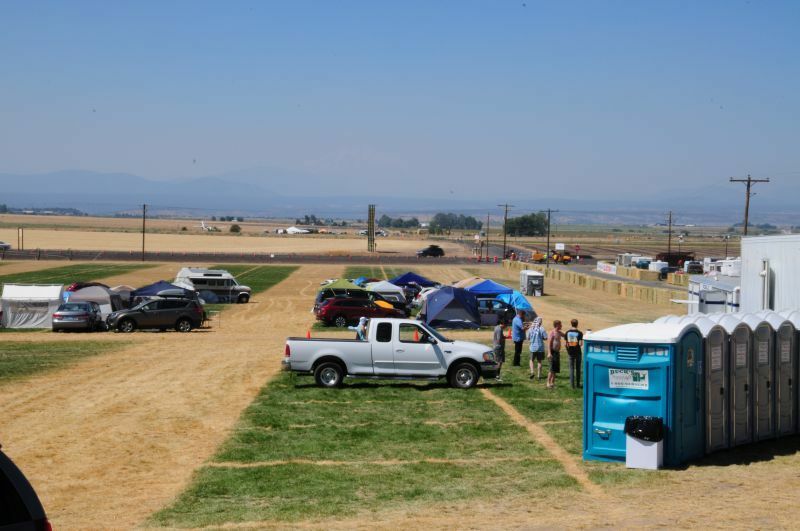 Madras, Oregon, was pegged as a premier viewing spot for the 2017 solar eclipse. The town of 7,000 started preparing in 2015 for an expected 100,000 visitors. That’s when Misty Cox got a call from the Jefferson County Tourism Group, saying they’d need the services of the company she runs with her husband Aaron Cox, Middleton Septic & Portable Toilets. Their lives took a turn that day as they spent the next two years working out the logistics of such a large undertaking. For the last year, service providers met monthly, working out traffic plans, dedicated service roads, and coordination. The company supplemented their 300 restrooms with units purchased from a company shutting down, but they still needed more. In the end, the company provided 29 ADA-compliant units and 38 hand-wash stations (PolyPortables, a division of Satellite; PolyJohn Enterprises; and Satellite Industries) in addition to 680 units including several hundred borrowed from various nearby companies. Misty Cox color-coded work orders to keep track of whose units were where. They placed 185 at Solartown in small banks, 25 at Solarfest, 77 in town, 45 at the airport, 43 at a Little League camp, 61 at Cove Palisades State Park, 18 in the city of Metolius, and the rest at private parties. 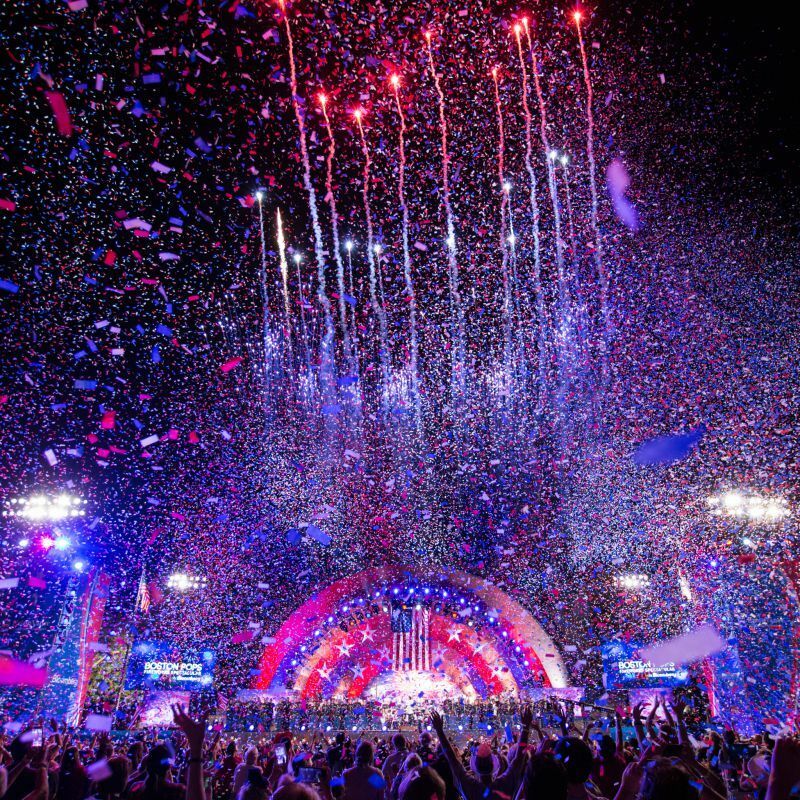 The annual Boston Pops Fireworks Spectacular is held July 3 and 4 in Boston in a park along the Charles River. It’s one of the biggest events of the year for the Boston Symphony Orchestra. 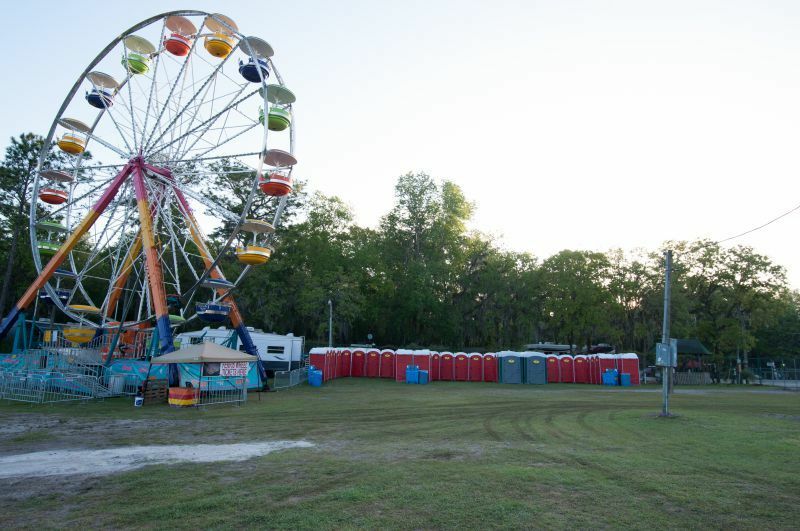 To service the event, USS provides roughly 430 restrooms and six hand-wash stations manufactured by Satellite Industries and PolyPortables, a division of Satellite, and one restroom trailer manufactured by Satellite Suites. Up to six vacuum trucks are used to support the event. All these trucks feature Hino chassis, carry 1,000-gallon waste and 500-gallon freshwater steel tanks, have Masport and National Vacuum Equipment pumps, and were built out by Amthor International. Based in Union, Missouri, Septic Services Inc. has 18 employees. Normally, just four of them work in the portable restroom division, but that changes for the company’s biggest event of the year: the Washington Town & Country Fair. “It’s one of the largest fairs in Missouri,” says Dave Flagg, Septic Services founder. “On this event, we’ll bring in extra people. We’ll take people from other parts of the company.” Flagg says usually nine people are assigned to work the fair, which runs Wednesday through Sunday, with a couple more people added on the weekend. The Washington Town & Country Fair has been operating since 1930 in Washington, Missouri, a Missouri River city of 14,000 people, about 50 miles west of St. Louis. The five-day event features nationally known entertainers, bronc and bull riding, freestyle American bullfighting, truck and tractor pulls, stadium motocross, demolition derbies, livestock shows, food booths, pie-eating contests, midway rides and exhibitions ranging from glass blowing to chain saw carving. The fair can be expected to draw 90,000 people or more over the five days. 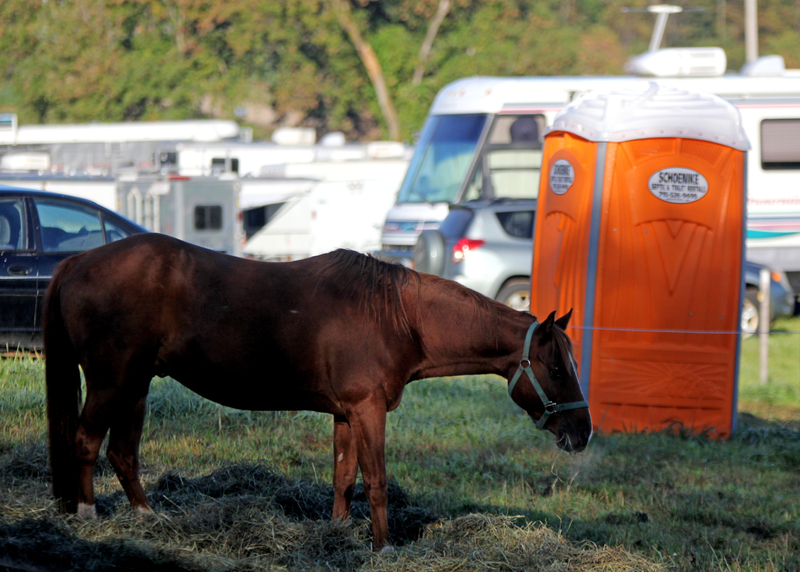 Septic Services has been the portable restroom provider for the event for 31 years. Septic Services delivers 140 portable restrooms, 13 to 15 sinks, and five or six wheelchair-accessible portable restrooms, all from PolyJohn Enterprises. 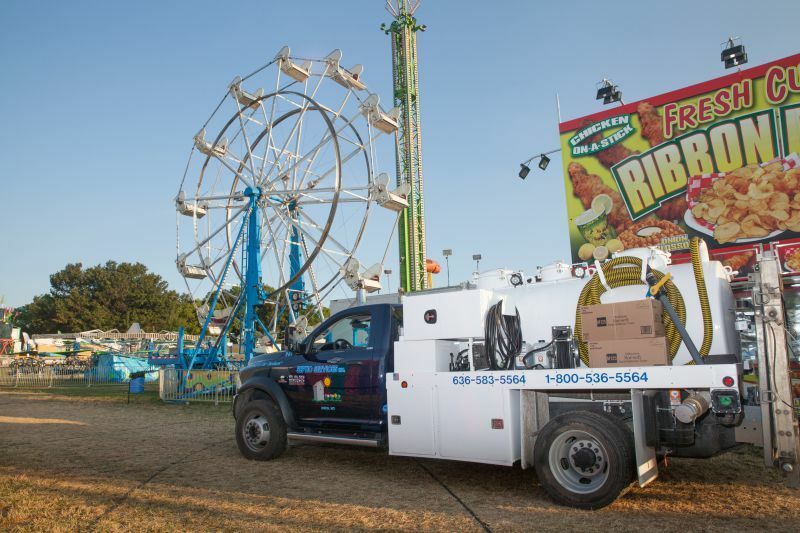 To service units at the fair, the company uses two vacuum trucks with a third one added on the weekend. 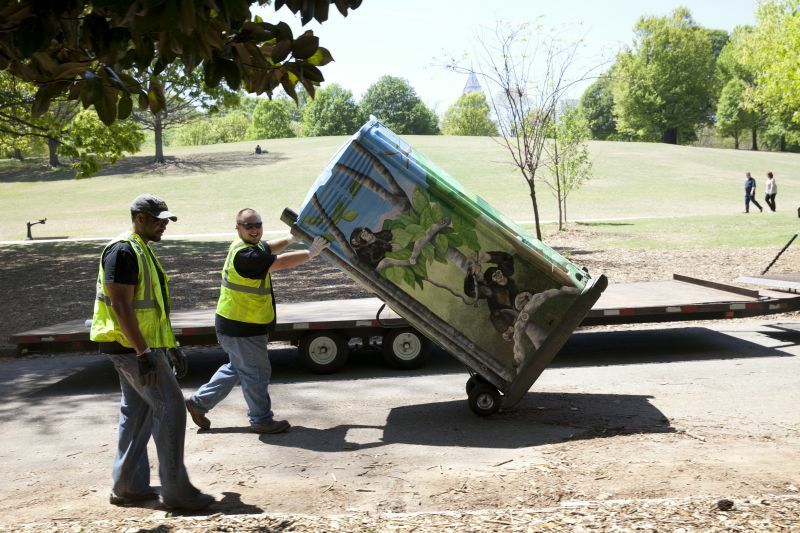 For the 11th consecutive year, the team from Pit Stop Sanitation Services supplied portable restrooms for Atlanta’s oldest fine arts festival, the Dogwood Festival, which dates back t o 1936. The art, music and food festival celebrated its 81st anniversary this year with bands on two stages, a fun run, children’s activities, an international village, fireworks, an artist market and a multitude of food vendors. Despite the threat of inclement weather, an estimated 200,000 people attended. With the supervision of event team leader Jay Strauss, six Pit Stop crew members provided services throughout the three-day festival while another three workers helped transport and set up. Event coordinator Rosalind Ross collaborated with Strauss to make adjustments as needed. Pit Stop set up banks of restrooms and hand-wash stations throughout the park, totaling 130 units. In the woods along the Suwannee River, the 600-acre Spirit of the Suwannee Music Park & Campground hosts a number of events during the year, including the April 20-22, 2016, Wanee Festival featuring 25 rock and jam bands. About 12,000 people attended. The lineup included a tribute to Butch Trucks, a founding member of the Allman Brothers Band, which hosted the event from its inception in 2005 until 2014. AAA Porta Serve has worked every event at the music park near Live Oak for 14 years, for clients that include different promoters — Live Nation in the case of Wanee Festival — and the park itself for perimeter campgrounds. They store units there year-round and have on-site cleaning facilities and septage storage tanks. The staff of eight all helped with the Wanee Festival between route work, along with 13 temporary workers pulled from a network of helpers they’ve developed over the years. The company supplied 280 standard and 15 wheelchair-accessible units (Five Peaks, Satellite Industries and PolyPortables, a division of Satellite), 10 Kros International USA urinals, 15 hand-wash stations (PolyJohn Enterprises and PolyPortables, a division of Satellite), 12 220- to 300-gallon holding tanks (Satellite Industries, Five Peaks, Kentucky Tank) outfitted with company-built 10-gallon strainer boxes, and two Progress Solar Solutions STL‑1000 solar light towers. They also had a contract to clean restroom and shower trailers supplied by another PRO, and provided RV servicing companies the option to use their storage tanks. The Molalla (Oregon) Buckeroo Rodeo started in 1913, when the residents of Molalla wanted to do something to celebrate the coming of the railroad to their town. Today, it’s the town’s biggest event and attracts top talent from the Professional Rodeo Cowboys Association. The 2016 festivities started the weekend before the Fourth of July with a Saturday kickoff concert and a Sunday trail ride. On Friday, July 1, after the kiddie parade, the serious rodeo competition began, continuing through the Fourth of July. Other activities included a steady stream of live music, dances, a carnival and lots of vendors. The Fourth of July was jampacked — pancake breakfast, 5K run, the Giant Street Parade, an afternoon rodeo, and a final evening rodeo capped by fireworks. Trent Clinkscales and his sister, Terry Shankle, own Clinkscales Portable Toilets & Septic Service in Molalla. The company has been involved in the rodeo and parade since winning the bid in 1996 and has worked hard to keep the account. Clinkscales starts setting up during the week leading up to the event, and places various restrooms, hand-wash stations, holding tanks and ADA units throughout the event grounds. 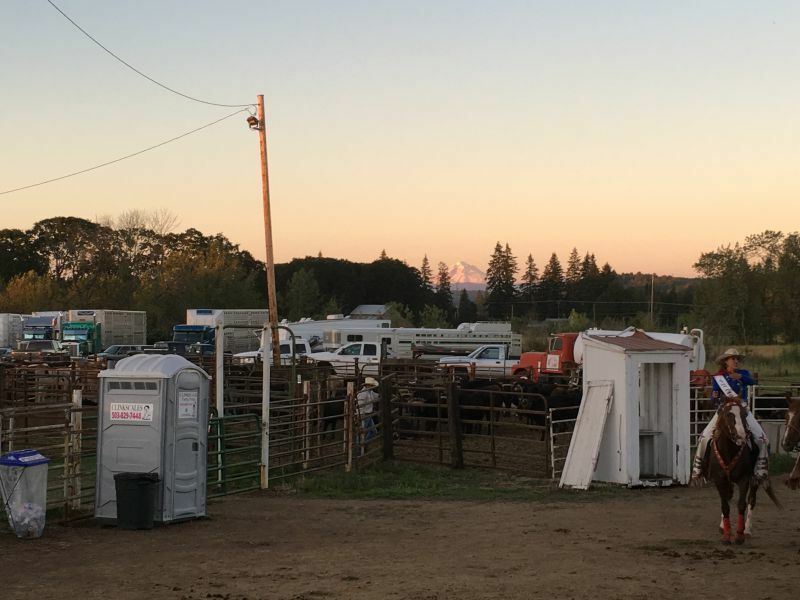 They also supply a two-stall shower trailer, rented from another PRO, for use by the rodeo contestants, clowns and entertainers who camp out for the duration of the event. Late on July 3 and early July 4, they also set up 30 more units along the nearly 3-mile-long parade route. Those units are donated by the company, in addition to auctioning off the right to put advertising on the units during the parade, raising even more funds for the Chamber of Commerce, which puts on the event. Plummer’s Disposal Service provides portable sanitation and solid waste management services in a 50-mile radius of Wyoming, Michigan, a suburb of Grand Rapids. Owner Nicholas Plummer oversees a staff of 17 technicians (a few more in the summer) and three office personnel who handle dispatch and other administrative functions. Plummer tends to manage the larger events that come their way and did so for the Irish On Ionia festival. About half the staff was involved in the job. The company has been working the Irish festival since 2013. 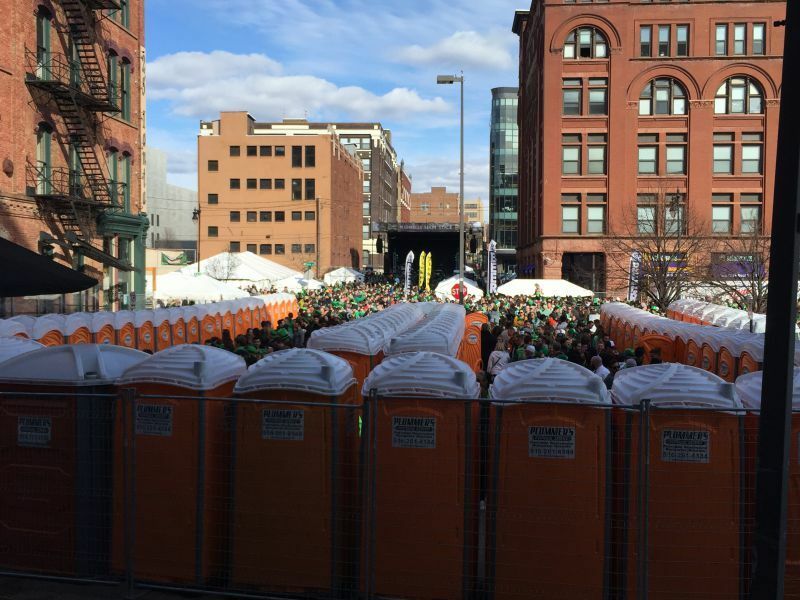 Irish On Ionia in Grand Rapids, billed as Michigan’s largest St. Patrick’s Day street party, is an adults-only, one-day beer-and-food festival. Some 20,000 attendees were admitted to the Saturday event, which stretched along three downtown blocks (one of which is Ionia). The company brought in 115 Five Peaks Glacier units, all with hand-sanitizer units. Most were the company’s signature orange, but 20 were pink urinal-free units with LED ceiling lighting. They also provided 12 PolyJohn Enterprises ADA-compliant units and six PolyJohn Bravo hand-wash stations. Another product they brought in, which proved to be quite a hit the previous year, was four KROS four-sided men’s walk-up portable urinals from Kros International USA Plummer bought at the Water & Wastewater Equipment, Treatment and Transport (WWETT) Show in 2015. ‘New’ Construction Site Requirements For Portable Sanitation?